Surprise, Surprise ~~ It's me! Well, it's been a long time since I've had any interest in creating cards or posting, but I think I'm back. While my recovery has been nothing short of a miracle, my head just wasn't into thinking about making cards or posting. Ladies, I didn't even shop, much, online for goodies or read any of my favourite sites. That had me more worried than anything else. But, finally, last night I was reading some posts and found out that a very dear friend is having a birthday. She has been so thoughtful, kind and caring that I wanted to make a card for her. 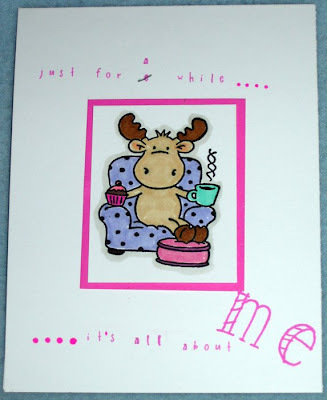 I went downstairs (yes, I know, I can do stairs now), into my new craft space (pictures to come soon) and made a card. I'm not naming any names because it's going in the mail tomorrow, but I wanted to let you all know that I'm BACK! Here's the card. The base is that delicious new colour, Berry Sorbet, from Papertrey Ink, as is the lovel Swiss Dot ribbon, also in Berry Sorbet. 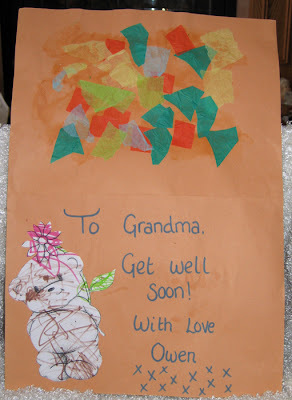 The stamps are Studio G clear stamps which were inside a Get Well card I received from Ellie. 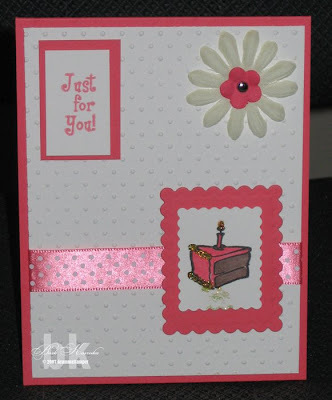 I used the Swiss Dot CB embossing folder on PTI Select White and a Prima flower with a silver brad to complete the look. I hope my friend likes the card. And, may I say once more, thank you to everyone for all the good wishes and all the prayers. I'm positive that the prayers have cut down the recovery time considerably. I'm still going to physio, but was told on Thursday that a discharge date is being considered within a couple of weeks. This journey has been an absolutely amazing one, and I'm so greatful to everyone who prayed for me. Thank you all, so very much. 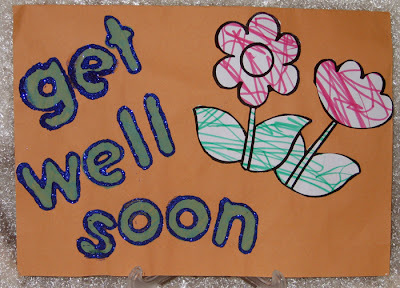 A very special get well card. Please allow a doting grandmother to brag just a wee bit. This card was made by Owen, my 21-month old grandson who lives in England. Of course, he had a little help from the daycare staff, but the work is mostly his. These are pictures of the front, inside and back and they're delightful! I want to draw your attention to the amazing detail in the colouring of the flowers. I'm sure Owen chose the colours and what a great job he did, too! I do believe the staff cut out the flowers and added the glitter to the letters for him, but the flowers are all his. On the inside of the card, Owen put the glue on the paper and then added all the little bits and pieces of coloured tissue paper on the top portion. I think it shows wonderful attention to detail and the placement of the bits and pieces is just perfect for such a young person. Don't you agree? And let's not forget the bunny. Once again, the colouring is exquisite and he managed to stay inside all the lines. I'm so impressed with his artistic talents. I can't wait to have him come over and start stamping with him. I think he's going to love it. Tim Holtz, look out! You've got some competition. Of course, the back page, or signature page, are his cute little hands. 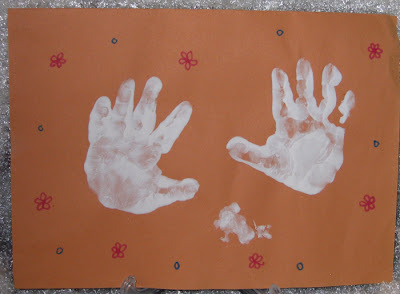 If you measure a childs' hands like you do the paws of a pup, I'd say Owen is going to be a big 'un, for sure! His little hands are adorable. I would also like to apologize for not posting more often this past week. 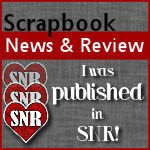 My DH did such a wonderful job keeping you all up to date on my progress and now that I'm home, I feel like I may be letting my readers down a little. While I'm feeling really good, I'm finding it very difficult to get my head into crafting mode. Not only that, but my schedule for exercising is brutal and my DD, Tiffany, and DH are making sure that I do the exercises. I'm really glad that they push me because I would tend to be lazy in that area and then this surgery would have been for nothing. I will not waste all the prayers and good wishes that have seen me come through this with flying colours. However, it leaves little time for anything else, believe me. I must lie down and put my leg in what is known as a Constant Passive Motion machine. I'm to do this for 1-1/2 hours on each leg, three times per day. Of course, while I'm strapped into this contraption, I can't do anything else. Then I have physio appointments 3 times per week on Monday, Tuesday and Thursday. Plus, the exercises I do in between being on the CPM machine. Very little time for crafting, but lots of time for thinking about what I want to do when I can get back to it. Just yesterday I received my package from PTI of the new cardstock colours and ribbons, so I need to play with those soon. Anyhoo, that's been my week and I hope you all will forgive me. I want to be back on track soon, so stay tuned, please. Hugs to you all. My first efforts since surgery! Sweet Riley and the Domestice Goddess set by Hanna Stamps were waiting for me to come home from the hospital. This morning I actually wanted to play, so I sat down and created these two little gems. 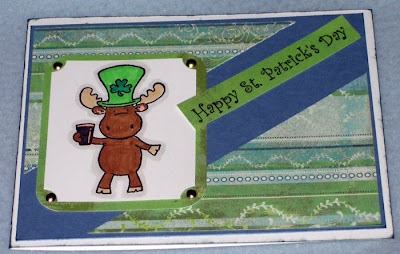 I made the St. Patty's Day card first, and really like how it turned out. Then, as I was gazing at the image of Riley sitting in the chair, feet up, coffee in one hand and cupcake in the other, it made me think of how my daughter, Tiffany and my DH, John, are looking after me. It really is all about ME at the moment and I'm rather enjoying it, I must say. Sitting at my craft table is even good exercise because I'm always moving my chair back and forth to reach here and there. It is on wheels, but also on carpet and it takes some muscle to move it around. Sometimes, if I'm feeling lazy and don't want to push, I just bend my knee a little more to go around an iris cart or whatever, so I'm actually exercising and not really thinking about it. YAY for stamping! Another useful purpose. Anyway, it's getting late, I'm starting to tire and have done my exercises twice today. John is a super coach. He sits right beside me and does my counting for me. The exercises are extensions, flexions, straight leg raises and such. I'm required to do 20 on each leg and, towards 14 or so it starts to get tough. But, John's there with the encouragement to get me through. He's amazing and I love him for being there all the way with me. Too soppy, I'm signing off now so I'll be back tomorrow most likely. I say most likely because sitting in this chair is challenging right now, but so worth it because you have all been there for me since day one and, once again, I want to express my appreciation for your prayers and thoughts. God Bless.